I have been very busy lately with house hunting, weddings, birthdays and general summer fun. Because of this I’ve been sticking to nice and easy dinners. This is one of my favourites – I’m definitely having a pomegranate moment this summer! This is a healthy, filling and delicious salad. 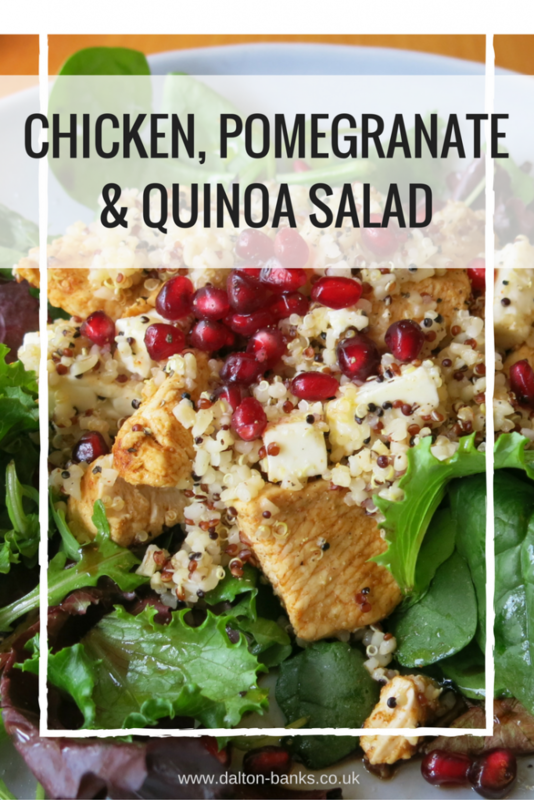 The sprinkle of feta adds a lovely saltiness to it, whilst the pomegranate gives a juicy burst. I use quinoa and bulgar wheat but you could also make it with cous cous. I like the nuttiness of quinoa. Crumbled feta – as much or as little as you want! Start with the chicken as then it can marinate whilst you prepare the rest of the salad. I picked these spices because it’s what I had in the cupboard – cumin gives it a moroccan feel but you could use more paprika and cayenne if you prefer. Slice your chicken into bite-size pieces and mix with the spices and lemon juice in a bowl and pop it into the fridge whilst you prepare the rest. Next, get your quinoa and bulgar wheat on. Because I’m lazy and they take roughly the same time to cook I throw it all in the same pan. When you’ve got about 5 minutes left to cook that, get your chicken on – I normally fry it in a griddle pan. 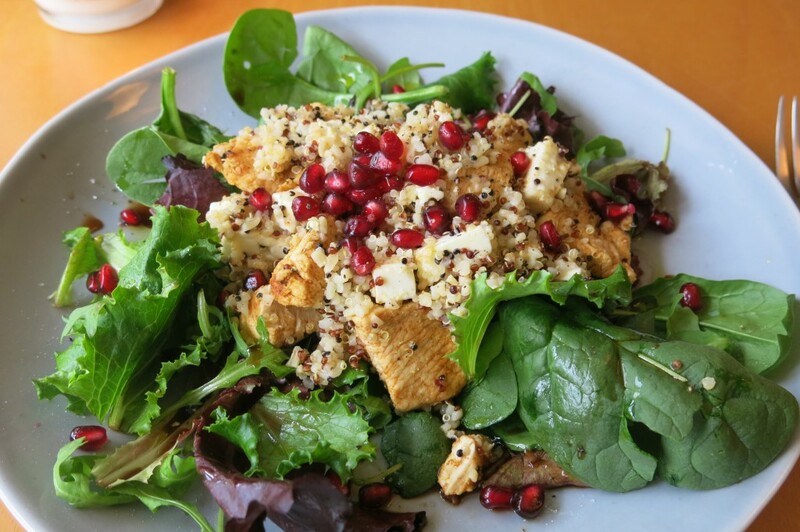 Once your chicken, quinoa and bulgar wheat are cooked place in a big bowl. Stir through your feta. Fill your plates with salad leaves and then spoon the rest on top. I love how the feta goes a little gooey when you’ve mixed it in! Sprinkle over the pomegranate seeds and drizzle some balsamic and olive oil and season to taste. This is such an easy dish and so tasty – you’ve got the warm spices, juicy pomegranate and salty feta. And filling and healthy too! Sometimes I make extra so that I can have it for lunch the next day as it keeps really well.